Chester boasts a complete circuit of historic walls, sections of which date back to Roman times, Chester’s most unique feature is the 13th century ‘Rows’ – two tiers of enticing shops, running through the main streets. Other attractions include the beautiful River Dee, the recently restored Grosvenor and Cheshire Military Museums, a Roman Amphitheatre, the Grosvenor Park and the city’s famous Roodee Racecourse. The famous Chester Rows are unique, being two-tiered galleries built in the traditional black and white ‘magpie’ style. They offer a wide range of shops selling goods from antiques to high fashion. Grosvenor Museum offers visitors the chance to explore 2000 years of Chester history. This includes Roman life, Chester wildlife - past and present, art galleries, and a unique Chester timeline. Entrance is free. You can take a light hearted journey through the Roman heritage of Chester. Tours last approximately 1.5 hours and can be provided, on request, at any time of the year. Chester Zoo is one of Europe's leading conservation zoos, with over 7,000 animals living in spacious and natural enclosures. The zoofari overhead railway and waterbus cater for your transportation needs. There is also a Children's Farm complete with Marmot Mania, brass rubbings and face-painting. Chester Market, having been established in Chester since Roman times, is one of the oldest functions of the council. There are many ways of seeing the attractions and surrounding areas of Chester. Tours by Foot, Bus, Rail and Waterway are all available. If you enjoy the festival atmosphere you can relax at the Chester races, the annual international film festival or food and drinks festival. All tastes are catered to in historic Chester. Chester Racecourse holds meetings throughout the summer months including the May Festival, a Family fun day and a Roman day. There has been racing on the Roodee at Chester for over 450 years and the thrill of watching a race at Chester unfolding before you from the sophisticated surroundings of the course’s enclosures or the vantage point of the City walls is an unforgettable experience. 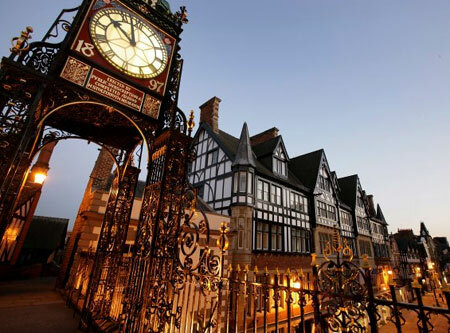 Bus tours operate from the Chester Visitor Centre that allows you to discover Chester from the comfort of a coach. Commentary is provided along the way by a knowledgeable and experienced guide. The tours take in such sites as the Amphitheatre, the River Dee and its bridges, the Old Port, and the Racecourse. The Annual Food and Drink Festival celebrate the success of local producers where they exhibit their fayre to over 6,000 food and drink lovers. The International Film Festival is run by the Chester Film Society. This popular annual event showcases fringe cinema from all over the world. The festival runs for a week, generally during early spring. A Cruise along the Waterways of Cheshire is not only relaxing but offers a chance to enjoy the attractive sites of historic interest, heritage and culture of the area. There are more miles of canals here than in any other English county. A Town Crier is a regular feature in the summer months You can enjoy this midday flamboyant spectacle at the Cross in the heart of the City, from Tuesday to Saturday from May to September. There is plenty of opportunity to pause and take refreshment during your strolls around Chester in one of the many cafes, restaurants and wine bars. Contained within this vibrant city is an eating scene of diverse proportions. The styles of foods available include Italian, Chinese, Thai, Indian and some of the best bars, night clubs and coffee houses you can imagine. Samsi Japanese Yakitori Bar. Instead of the menu being divided the traditional manner of starters and main course you will find that most dishes are available in appetiser and main course portions. For people unaccustomed to Japanese food assistance is available. Vito's Trattoria Pizzeria. This is a traditional pizzeria where the waiters pace about with enormous pepper mills and straw-wrapped Chianti bottles hold candles over gingham tablecloths. All the old favourite dishes appear on the long menu. Chez Jules Restaurant. Located in a former fire station this is a bistro style restaurant where the reasonably priced menu is changed daily. There are usually about six starters and the same number of mains on offer. It is a firm favourite with the locals. Mongolian Barbeque. An award-winning restaurant that offers customers the chance to choose their own combination of meat, fish and vegetables and then watch as they are stir fried on a huge Mongolian style griddle. The Boot Inn, Chester’s oldest public house dates back to 1643, its façade was rebuilt and restored in the late 19th century and again in 1988. This very attractive 17th Century inn is accessible from the street level by narrow stony staircase. This leads into a large hall, which is divided into two main sections. Features include a fireplace, a large bar counter, low ceilings and exposed beams. The city of Chester has a wide range of hotels and quality assured guest houses suitable for the business traveller and tourist alike. Elsewhere in Cheshire your options include luxurious country house hotels, excellent farmhouse B&B’s and self catering. Telford’s Warehouse is an independent family run bar/restaurant and an internationally renowned music and arts venue. Upstairs is a popular restaurant and contemporary art gallery. The lower area and bar are reserved for the many popular live music nights which having played host too many famous names that have helped to establish ‘Telford’s’ as one of the most important venues in the country. The Miniature Theatre of Chester is based at the Chester Town Hall, performing works that include both world premieres and plays by local talent. Alexander's Jazz Theatre is the leading North West venue for jazz, blues and rock artists. It hosts Chester Jazz and Blues Festival. Alexander's is also a famous for the alternative comedy nights every Saturday. Chester is an excellent destination for that short break. It is a city where you can immerse yourself in history, shopping or elegance. This Roman city and its 21st century delights will leave you feeling relaxed and refreshed.